BMW AC SCHNITZER handbrake cover. Up for sale is 1x Genuine Carbon Handbrake. Z4 E85/E86, E89. This e-brake handle is Cast Aluminium skillfully wrapped in carbon fiber. OEM style CARBON FIBER HAND BRAKE. 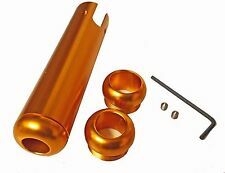 Universal Racing Style Car Handbrake Cover Sleeve Machined Aluminum Gold. Colour: Gold. Includes: Handbrake Handle Cover. 1 x Hex Key. Transform the look of your cars interior in seconds. Fit for most car handbrakes. Size：Like the picture show. Detail Image. Color: Brown, Carbon, Silver. Different Color and the fashion design. 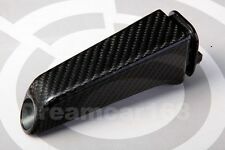 Carbon & Chrome Universal Car Handbrake Self Adhesive Brake Lever Cover ! Color: Carbon. Fit for most car handbrakes. Size：Like the picture show. Transform the look of your cars interior in seconds. Detail Image. Different Color and the fashion design. We will try our best to reduce the risk of the custom duties. Universal Racing Style Car Handbrake Cover Sleeve Machined Aluminum Gold. Colour: Gold. Handbrake Handle Cover. 1 x Hex Key. Protect and decorate greatly your car hand brake lever. 1x Car Hand Brake Cover. - Universal, fits Most car. - Color: Black. Vauxhall Tigra Twintop -- [2004-2009] Convertible. Our service team is happy to assist you. Product number: LP-0163-HB--11. Fits the following models. Okzam Limited Trade ID-UK: 7349553. OEM: 578518, 578519, 578537. 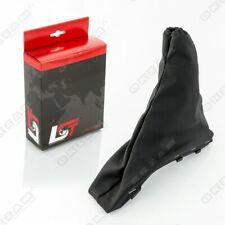 Black Universal Car Aluminum Hand Brake Sleeve Handbrake Handle Hand Protector Cover. 1x Handbrake Cover and fitting as picture. Fit any car which have brake handle. Made by A6061 Aluminum. We will reply you within 24- 48 hours. SEAT IBIZA. SPORTS HANDBRAKE LEVER COVER. GENUINE NEW. Part Number Finis Code : 1334522. Genuine Ford Alloy handbrake cover. To Fit Ford Focus Models. To Fit Ford Focus Cabriolet Models. To Fit C-Max models. The legends handbrake handle is made from begonia red smooth Nappa leather. A1 (2010 onwards). Hand Brake Lever Cover. IBIZA 2009-15 MODEL YEARS (6J). With the exclusive designer sports accessory from SEAT you'll really enjoy being inside your Ibiza. GENUINE SEAT ACCESSORY HANDBRAKE HANDLE. PARTS DEPOT - GENUINE PARTS WITH GENUINE SAVINGS! New. Genuine. Unused. Still in original packaging. Price of postage for mainlands only. For Scotland and Islands price will be different. Please ask. The Ford Ka Hand-Brake Cover adds that extra touch of style to the interior of your car. 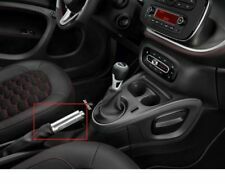 The Ford Ka Hand-Brake Cover is supplied with full fitting instructions. Suitable for all Ka models from 09/2008 onward unless otherwise stated. Vauxhall Astra MK IV [1998-2005] Saloon. Vauxhall Astra MK IV [1998-2005] Hatchback. Vauxhall Astra MK IV [1998-2005] Estate. Vauxhall Astra MK IV [1998-2005] Coupe. Vauxhall Astra MK IV [1998-2005] Convertible. Protect and decorate greatly your car hand brake lever. - Material: Silicone. 1x Car Hand Brake Cover. - Color: Blue. GENUINE BMW 3 SERIES F30 M PERFORMANCE CARBON FIBRE HANDBRAKE HANDLE & GAITOR. An eyecatcher: Handbrake grip for even sportier design on the cockpit. GENUINE BMW F20 F21 F22 1 AND 2 SERIES M PERFORMANCE ALCANTARA/SUEDE CARBON FIBRE HANDBRAKE HANDLE & GAITOR. An eye-catcher: Handbrake grip for even sportier design on the cockpit. THIS IS FOR M CARS ONLY I.E. M2 F87, M3 F80, M4 F82/F83, M5 F10, M6 F06/F12/F13, X5M F85 AND X6M F86. M POWER IN GLOSS CARBON FIBER. GENUINE BMW M PERFORMANCE GEARKNOB TRIMS. All used parts and accessories are not covered by a warranty but are sold in good working order (unless otherwise stated). An eyecatcher: Handbrake grip for even sportier design on the cockpit. THIS IS FOR LEFT HAND DRIVE CARS ONLY ! All used parts and accessories are not covered by a warranty but are sold in good working order (unless otherwise stated). It is grey in colour and made from real leather and aluminium. Hand brake grip. It has the words RACE SPORT in the middle of it. Hand brake grip. it is grey in colour and made from real leather and aluminium. 100% Money back policy in place if you are not happy. HANDBRAKE COVER. (to suit handbrake styles as illustrated below). make Supersized seem small. Opel Astra H Twintop H [2005-2010] Convertible. Vauxhall Astra Twintop MK V [2005-2010] Convertible. Vauxhall Astravan MK V [2005-2017] Box. Opel Astra H H [2004-2016] Box. Our service team is happy to assist you. Box contains: 1 x Gear Gaiter & 1 x Handbrake Gaiter. SAAB 9-5 (1998-2010). Stitching Colour: Red "95" Embroidery. We specialize in customisation of car interior but also in creating unique and personalized products made of genuine leather or suede material. Fiesta mk 8 2013 Handbrake lever. Aluminium button screws in place of plastic item. Excellent finishing touch Fits all 911's 1965 to 1989. GENUINE VW TRANSPORTER HANDBRAKE LEVER. This handbrake lever will fit the T5/T6 VW Transporter Models. VW Transporter (T6) which we have now converted & is in excellent condition. VW Part Number: 7E2 711 301 N.
Isle of Wight. Removed from 2007 BMW 630i coupe, automatic, black. Isle of Man. Scilly Isles. Channel Islands. The Scottish Islands. The Scottish Highland. Northern Island. Opel Corsa C C [2000-2017] Box. Opel Corsa C C [2000-2016] Hatchback. Product number: LP-0163-HB--14. Our service team is happy to assist you. Fits the following models. Okzam Limited Trade ID-UK: 7349553. High quality food level and eco friendly silicone,odourless and no toxic. Universal fit. Simple Installation. product is designed with nonslip surface,and it is comfortable to grip. Weight : 25g. We will respond to you within 24 hours and do our best to help you out. Conrero Hand Brake Lever Sleeve. Conrero Logo. Designed to fit - Peugeot 306. Beautifully made in Brushed Aluminium. Complete with presentation tin - would make a nice gift. We will always help you to have a 100% positive happy buying experience. This Mountney Classic Ribbed Handbrake Grip is a suitable for the Austin Mini. It fixes to the lever using an allen key nut. Technical Details: Material: Aluminium. All cheaper oils and the 'synthetic' component of part-synthetic or semi-synthetic oils are hydrocracked mineral oils. Pattern: Stripe. Material: Aluminum. Built with maximum width for full tread coverage. 1 x Car Handbrake Cover. This item have 3 months warranty. And then screw special self-tapping screws into holes. Universal Black Car Handle Brake Cover Side Handbrake Sleeve Racing Style. Fit any car which have brake handle. Made by A6061 Aluminum. WE HAVE THIS ITEM IN 4 COLOR. RANGE ROVER P38 Vogue SE Genuine Black Leather Hand Brake Lever Handle and Cream Leather Gaiter. Will fit Range Rover P38 models 1994 - 2002. NEW BLACK LEATHER HAND BRAKE GAITER. THIS GAITER IS MADE FROM TOP QUALITY SUPPLE LEATHER. TO FIT AN AUDI UR QUATTRO TURBO COUPE Wr - Mb & Rr. AUDI OE PART No:857 711 461WITH COLOUR CODE 01Z (BROWN). Vauxhall Astra MK III [1991-2001] Saloon. Vauxhall Astra MK III [1991-2001] Hatchback. Vauxhall Astra MK III [1991-2001] Estate. Vauxhall Astra MK III [1991-2001] Convertible. Our service team is happy to assist you.